Comments Off on The Music World Celebrates the 20th Anniversary of Nirvana's "Nevermind"
It’s hard to believe that the album that rewrote the rules for popular music (at least for a few years) is now two decades old. 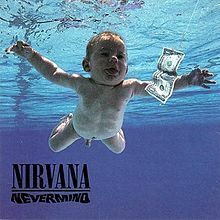 Nevermind, along with Nirvana itself, was responsible for bringing alternative rock to a large mainstream audience, and critics subsequently regarded it as one of the best rock albums of all time. From its eye-catching cover of a baby bobbing for a dollar on a fishing hook , to the way each song hit you over the head, Nevermind became an instant music classic and launched Nirvana into rock superstardom. Released on September 24th 1991 with major hits such as “Smells Like Teen Spirit” and “In Bloom”, the monumental record has since sold more than 30 million copies and has spent 253 weeks on the Billboard 100 chart. In honor of the 20th anniversary, MTV News will be celebrating all week with videos, interviews, and so much more. I think it would be appropriate for us all to take some time out of our “busy” days to sit back and listen to a legendary album that changed the music world forever. I know that’s what I’ll be doing.